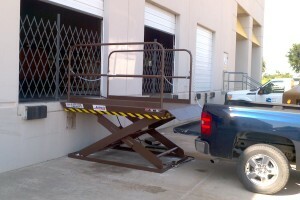 Whether you’re talking pickup trucks, fork trucks, tractor-trailers, or armored tanks, Grace Material Handling can design standard and specialized dock scissors lift and platform lift solutions for loading and unloading variable height truck beds at the dock, raising and lowering loaded vehicles from one elevation to another, and spanning distances across railroad tracks to accommodate loaded vehicles. Streamline your inventory warehousing and inventory control operations with custom designed and manufactured scissor lift tables, industrial tilters, and industrial turntables to enhance worker productivity through ergonomics; increase efficiency and throughput by integrating with automated systems; expand storage of parts with mezzanine and work platform storage lifts; and build up or break down palletized loads in the shipping and receiving area. 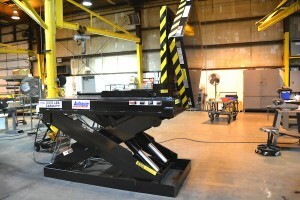 We are provider of scissors lifts, vertical reciprocating conveyors (freight lifts), and vertical ram lifts for industrial mezzanine applications. 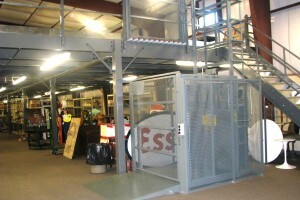 This includes accessing multiple mezzanine landings with equipment and supplies, and expanding vertical parts storage space to increase the overall usable square footage of a building. 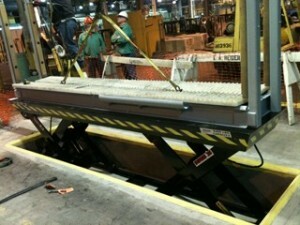 450 million new pallets are produced each year in the USA. And there are approximately 1.5 billion pallets in use at any given time. Manual loading and unloading of pallets continues to be one of the most common tasks performed in industry today. 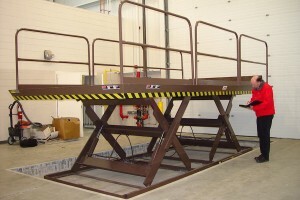 We are a provider of lift solutions for performing safe and efficient pallet handling applications; such as industrial lifts, tilters, and turntable products. Just fill out our short form and one of our lift experts will contact you right away.